100 Mozart’s Children ♫ Sächsische Mozart-Gesellschaft e.V. We want musical education for 100 children by the end of 2018. This project started in September 2008. Currently, 56 children and youngsters are a part of it. We enable professional musical and emotional education since the beginning of elementary school until the end of studies for children and youngsters, who regularly take instrument lessons and are aged 7-21. The lecturers are trained professional pedagogues and the Music School Chemnitz (Städtische Musikschule Chemnitz) or another certificated music school within the region. Being a part of this project means to support continuously since the beginning to the end of studies. Because of this reason, the Mozart’s Children and the Saxon Mozart Company (Sächsische Mozart-Gesellschaft e. V.) will enter into a contract. The 100 Mozart’s Children ensemble’s responsible leaders are the violinist and qualified music pedagogue Thu Trang Sauer and the hornist and percussionist Mathis Stendike. They have the support of experienced musicians from various instrumental areas. Patron of this project is the Reichstag’s ex-president Erich Iltgen. Let’s enjoy music together! We make, support, organize, preserve and enrich new music pieces thanks to our concerts and projects. to long-termly and continuously support children and youngsters aged 7-21, that is, best since the beginning of the school attendance until the complete end of studies or until the beginning of the professional training or studies. To reach these goals, life experience is needed. It strengthens and adapts individual and group playing and makes better various aspects of life in the spirit of our motto — Fulfillment through music. This can’t be established only by the musical instrument lessons, but primarily by playing together in an ensemble and by playing in front of an audience. Projects, that will expand the “active radius” and will teach about the culture processes, will be realized at least once a month within the instrument lessons. The culture processes shall be demonstrated through the visit of cultural institutions, events, the provision of education materials, traveling, cooperation and exchange with our partners (among others the Czech Republic and Italy). These events can’t be organized by the teachers alone. We are counting on our partners. We don’t support only significant musical talents. We also integrate children, who may have musical talent, but not adequately mature personality. We can support seemingly weak children in developing their strong points thanks to our increased attention and we can also turn their weak points into the strong ones. These children then enrich their immediate surroundings, respectively the society with their positive experience. We make it possible for them to notice each other and we appreciate those, who desire to fulfill their life with music and playing. We help, when it’s impossible to go further! The project’s financing will provide approximately half of the children with a musical instrument or a partial education costs takeover, the reasons may be special talent of the child or the family’s financial options. That’s why it is necessary to submit the family’s income/social situation. The financin go far has been mainly through donations und sponsoring. The 100 Mozart’s Children’s choir always finds an excited audience. Thanks to the cooperation with the social-pediatric centre of the polyclinic in Chemnitz we can make the children, who therapeutically strengthen their personality through music, join the collective. This way, all of us together (including the parents and teachers) deepen our social skills. We make memories and succeed together. We don’t assess these special children with special talent based on their musical skills and performances. They teach us, that if a feeling for music and musical hearing coexist in harmony, it’s a gift. Their desire to reach beautiful sounds, their playing together, musical expression and musical joy gain our respect and are the reward for the hard work we put into the 100 Mozart’s Children project. We are looking for active patrons and maecenas’, who will support the Mozart’s Children by donating 100 Euro. You may also contribute a smaller amount, each Euro counts! We will keep you regularly informed about the progress the child makes thanks to your help. As a thanks to all patrons, the children will hold a concert at the end of the year. Donate or become a patron! One Euro becomes two Euros – we plan on financially supporting another 20 Mozart’s children through the Foundation! The Saxon Mozart Company (Sächsische Mozart-Gesellschaft e.V.) wants to long-termly secure the 100 Mozart’s Children project by founding the German Mozart’s Foundation (Deutschen Mozart-Stiftung) . The Foundation’s project gains permanent financing by providing subsidies. It works on the principle of doubling each gained Euro. That’s why we are still looking for sponsors and patrons, who are willing to support the project. RC Hilfswerk des Rotary Club Chemnitz Schlossberg e. V.
How to become a Mozart’s Child? The child’s permanent interest in learning to play an instrument and their participation in the project’s activities are necessary. The recommendation and application may be made by the parents, the children themselves, relatives, teachers etc. 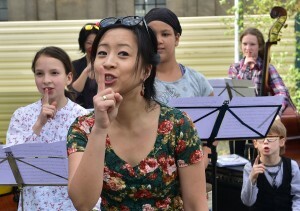 The ensemble’s leader and the Board of Directors of the Saxon Mozart Company (Sächsische Mozart Gesellschaft e. V.) shall decide on the acceptance depending on the project’s financial possibilities and the level of performance and support of the child, all after a consultation with parents and lecturers of the instrument in question.